The innovative system solutions for non-contact temperature measurement found great interest among trade visitors at the Thermprocess fair in Dusseldorf. 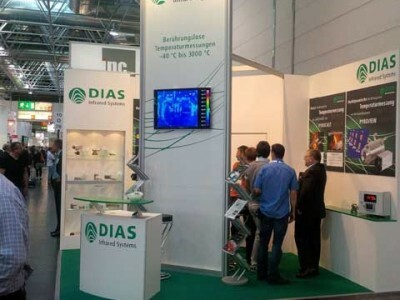 DIAS Infrared presented technological innovations for monitoring the temperature up to 3000 °C. The variety of industrial heat treatments is reflected in the system solutions of DIAS for temperature monitoring. . High quality requirements meet the melting, casting, forging, hardening, preheating depending on the production and the materials such as aluminum, iron, cast iron, steel, lead, brass and nickel, platinum, copper or zinc. The accurate control of the temperature is a very important parameter for the material characteristics and so thus the fulfillment of the use claims of the produced goods. The thermal imagers, pyrometers and complete system solutions from DIAS Infrared from Saxony are the flexible helpers. The innovative system solutions found great interest among trade visitors at THERMPROCESS from 16 to 20 June 2015 in Dusseldorf . An example: At high temperatures thermal imagers with a large measuring range, without the need to switching, are used. In addition to the standard range from 600 °C to 1500 °C, e.g. the PYROVIEW 512N of DIAS can be factory set to a continuous range from 1400 °C to 3000 °C. These high-end temperatures are reached for example in the blast furnaces of steel mills in the reduction of unwanted substances from the liquid melts.